S. Thomas Summers is a teacher of English at Wayne Hills High School in Wayne, NJ and an adjunct professor at Passaic County Community College in Paterson, NJ. He is author of three poetry books, including Private Hercules McGraw: Poems of the American Civil War, which has been nominated for a Pushcart Prize. Summers’ poetry has also been featured in several respected reviews and journals: The Atlantic, the Loch Raven Review, MiPo, and The Pedestal Magazine. He lives with his wife and children in the hills of Northern New Jersey and blogs at http://www.thelintinmypocket.wordpress.com. Poem by poem, Private McGraw ($15 – Click to Order, ISBN: 978-1-937536-14-5, Hardcover ISBN: 978-1-68114-172-5, LCCN: 2011945703, PS3619.U45946 P75 2011, 6X9″, 86pp), each poem’s speaker, shares with us his journey through the landscapes of the American Civil War. McGraw, a Confederate soldier and racist, steps into the War in order to assure that slavery will exist long enough for him to purchase a slave with hopes to impress his love, Martha. As McGraw treks through the blood and mire, experiencing both triumph and tragedy, he begins to transform into a man of peace and compassion – a man who no longer sees a black man or a white man; he simply sees a man – a fellow, a brother. 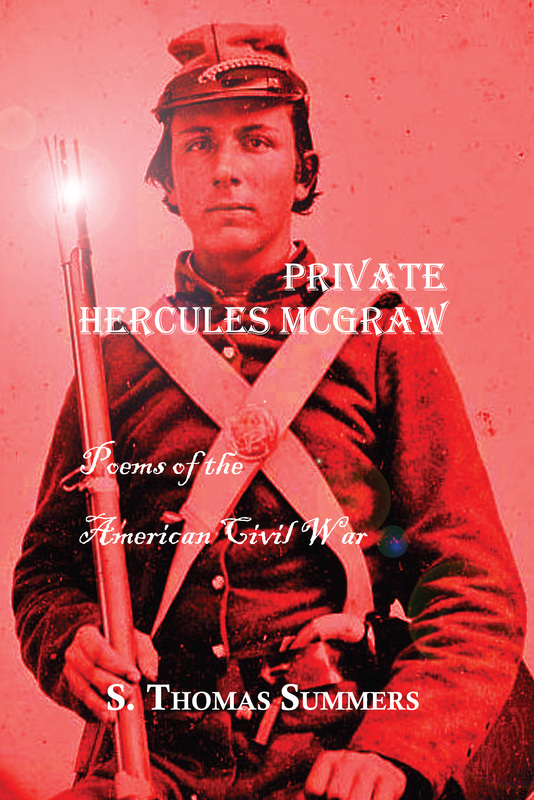 S. Thomas Summers’s Private Hercules McGraw: Poems of the American Civil War is a beautiful expose on the human condition in wonderful, flowing prose that is as naked as man and as stark as war. Most importantly, the poetry within demonstrates how that human condition evolves when a person is forcibly faced with the realities of his changing beliefs and values. Everyone interested in America’s Civil War – student as well as scholar – will relish this poetic story of one man’s war; and likely every reader will recognize himself/herself within its lines. In a series of poems reminiscent of Stephen Vincent Benet’s epic work John Brown’s Body, S. Thomas Summers tells us a tale of war, and the evolution of a feckless youth into a veteran deeply scarred by his experience who comes to recognize the universality of humanity. If anyone wants to know what it was like to be a soldier during our nation’s bloody Civil War, he/she should read Summers’s haunting poems. Summers gets right down there with the blood and the grunge to chronicle the life of a soldier who both survived and, in many ways, perished. These expertly written portraits represent both a poetic and historical triumph. The Journals of Lt. Kendall Everly: A Story of the American Civil War ($15, ISBN: 978-1-937536-41-1, Hardcover ISBN: 978-1-68114-151-0, LCCN: 2013904201, 6X9″, 80pp): is the second book in S. Thomas Summers’ Civil War series. A school teacher and a pacifist, Kendall Everly pits himself against the war, saddened by the fleeting innocence of his students and the purity he feels that innocence personifies. Everly embraces the Union effort and enlists, a noble effort to protect the youth he knows will soon understand the terrible realities of blood and steel. Yet, the war and its horrors envelope him, transform him into a man he no longer knows or recognizes. 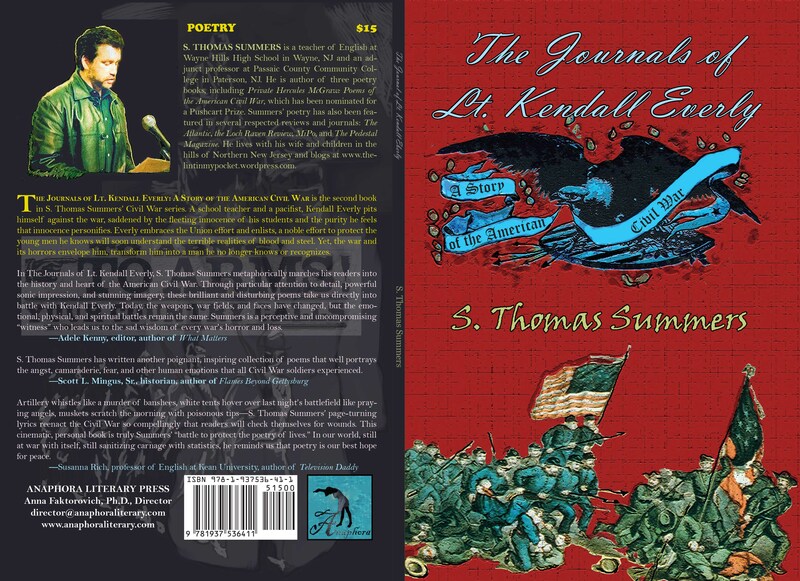 In The Journals of Lt. Kendall Everly, S. Thomas Summers metaphorically marches his readers into the history and heart of the American Civil War. Through particular attention to detail, powerful sonic impression, and stunning imagery, these brilliant and disturbing poems take us directly into battle with Kendall Everly. Today, the weapons, war fields, and faces have changed, but the emotional, physical, and spiritual battles remain the same. Summers is a perceptive and uncompromising “witness” who leads us to the sad wisdom of every war’s horror and loss. S. Thomas Summers has written another poignant, inspiring collection of poems that well portrays the angst, camaraderie, fear, and other human emotions that all Civil War soldiers experienced. Artillery whistles like a murder of banshees, white tents hover over last night’s battlefield like praying angels, muskets scratch the morning with poisonous tips—S. Thomas Summers’ page-turning lyrics reenact the Civil War so compellingly that readers will check themselves for wounds. This cinematic, personal book is truly Summers’ “battle to protect the poetry of lives.” In our world, still at war with itself, still sanitizing carnage with statistics, he reminds us that poetry is our best hope for peace.